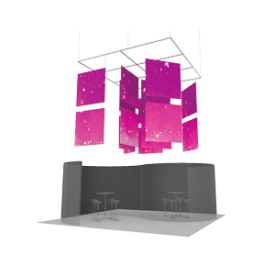 Formulate® Hanging Structures and signs are ideal for attracting attention or for use as a focal point at an event or in an interior space by projecting messaging from all angles and drawing the eye to a brand! Available in three collections including Essential (economy), Master (mid-range) and Custom (premium), it is easy to find the hanging sign that fits your need. Browse a wide range of shapes and sizes to find the perfect fit for your tradeshow exhibit, or interior commercial or retail space. Formulate Essential fabric hanging structures are an economy range of standard, simple hanging structure shapes. The customary, economy aluminum tube frames feature bungee cords and comes with a one year limited hardware warranty. Simply pull the pillowcase fabric graphic over the frame and zip. Formulate Master tension fabric hanging structures are made in the USA and are of the utmost quality and durability. Formulate combines state-of-the-art zipper pillowcase dye-sublimated stretch fabric coverings with advanced, lightweight aluminum structures to provide unique design, functionality and style. 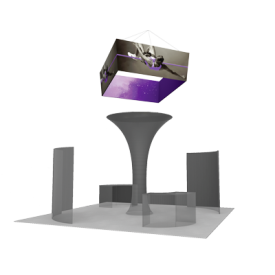 Master hanging structures are available in a wide variety of 3D shapes, sizes and styles. Uniquely designed. Custom built. 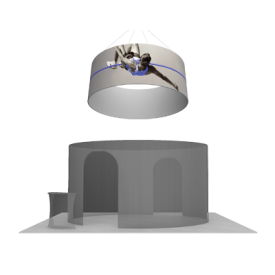 We FORMULATE custom tension fabric hanging structures for tradeshows and all types of interior environments. Our expert team of project managers, designers, detailers and welders work together to build and deliver uniquely crafted, superior quality structures, designed to last a lifetime.